Theories of Genius and Crime. Italian alienist and criminologist; born Nov. 18, 1835, at Verona. Both his paternal and his maternal ancestors belonged to the tribe of Levi. On his father's side he was descended from a family which for many generations had been rich in rabbis and Hebraists. His maternal ancestors were chiefly manufacturers and bankers who had long been established at Chieri, Piedmont. But in this branch of his family, also, there were many men of great talent, among others the poet David Levi, who took an important part in the Italian struggle for liberty, first as a Carbonaro, and afterward as a deputy. Under Professor Marzolo, Lombroso studied Hebrew, Aramaic, Arabic, and Chinese, intending to devote himself wholly to philology. He afterward studied medicine at Padua, Paris, and Vienna, and from the very beginning showed an especial preference for the study of insanity. While still a student he wrote two essays—one on insanity in antiquity, and one on the insanity of Cardan—in which, for the first time, was pointed out the connection between madness and genius. Lombroso served as physician in the Austro-Italian war (1859). The scientific results of his military service were two papers on amputation (which were awarded the Riberi prize, the only official academic reward he has ever received), and a work on Calabrian folk-lore, which subject he had an opportunity of studying after the conclusion of peace, when he and his regiment were transferred to Calabria. As this regiment was composed of soldiers from all parts of Italy, Lombroso took advantage of the opportunity thus afforded him to study the ethnical types of the Italian people, and to lay the foundation for an ethnographical-anthropological chart of Italy. Some time later he was sent from Calabria to Pavia, where he asked permission to visit the insane asylum regularly, in order to acquire greater knowledge in his specialty. This permission being refused, he abandoned the military career. His experience during the following year was a very trying one. He taught at the University of Pavia, and served as a physician in the insane asylum; but in both cases he gave his services gratuitously; and at night, in order to earn a bare subsistence, he had to make translations from the German. It was under such circumstances that he produced, among other works, his Italian edition of Moleschott's well-known work, "Kreislauf des Lebens," under the title "Il Circuito della Materia." At length, after a year of extreme want, he was made professor of psychiatry at Pavia, with a yearly salary of 2,000 francs ($400), at that time a very considerable sum to him. His first two pamphlets, which he wrote during two sleepless nights, deal with genius and madness, and contain in embryo all the ideas afterward developed in his great work, "L'Uomo di Genio" (see below). During the first year of his professorship he wrote "L'Uomo Bianco e l'Uomo di Colore," a work treating of the development of the human race, which development is conceived entirely from the point of view of the theory of evolution, and is filled with Darwinian ideas, although at that time Lombroso knew neither Darwin nor Herbert Spencer. In Pavia, also, Lombroso began his studies of pellagra, a peculiar skin-disease prevalent in northern Italy and the origin of which was totally unknown. He showed conclusively that it was due to a poison developed in old, moldy corn, the only food of the poor agricultural laborers of the country. On account of his discovery of the real cause of this malady he was denounced by the landed proprietary to the government as a madman; and it was demanded that he should be deprived of his professorship. Years later, however, his theory of pellagra was accepted by the whole profession. On the skull of a criminal executed at Pavia, he noticed the fossa occipitalis media, an atavic feature which he was the first to observe. 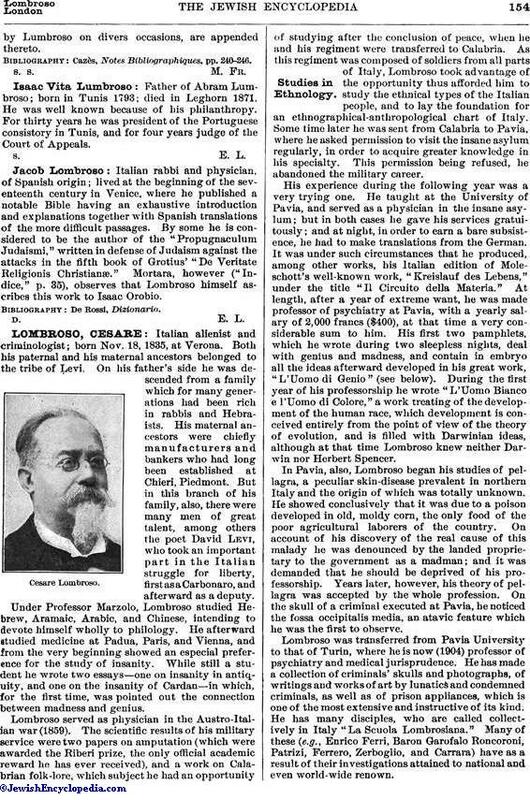 Lombroso was transferred from Pavia University to that of Turin, where he is now (1904) professor of psychiatry and medical jurisprudence. He has made a collection of criminals' skulls and photographs, of writings and works of art by lunatics and condemned criminals, as well as of prison appliances, which is one of the most extensive and instructive of its kind. He has many disciples, who are called collectively in Italy "La Scuola Lombrosiana." Many of these (e.g., Enrico Ferri, Baron Garofalo Roncoroni, Patrizi, Ferrero, Zerboglio, and Carrara) have as a result of their investigations attained to national and even world-wide renown. Lombroso's name is chiefly connected with two theories: (1) that genius is a peculiar, psychical form of larvate epilepsy; (2) that there is a degenerate class of human beings, distinguished by anatomical and psychical characteristics, who are born with criminal instincts and who represent a reversion to a very primitive form of humanity. He has made a rich collection of materials for the investigation of his theory that genius is a form of epilepsy. 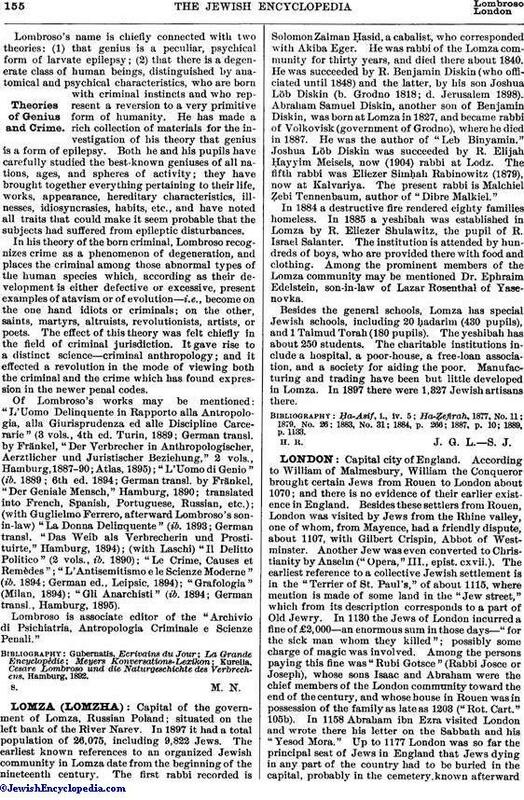 Both he and his pupils have carefully studied the best-known geniuses of all nations, ages, and spheres of activity; they have brought together everything pertaining to their life, works, appearance, hereditary characteristics, illnesses, idiosyncrasies, habits, etc., and have noted all traits that could make it seem probable that the subjects had suffered from epileptic disturbances. In his theory of the born criminal, Lombroso recognizes crime as a phenomenon of degeneration, and places the criminal among those abnormal types of the human species which, according as their development is either defective or excessive, present examples of atavism or of evolution—i.e., become on the one hand idiots or criminals; on the other, saints, martyrs, altruists, revolutionists, artists, or poets. The effect of this theory was felt chiefly in the field of criminal jurisdiction. It gave rise to a distinct science—criminal anthropology; and it effected a revolution in the mode of viewing both the criminal and the crime which has found expression in the newer penal codes. Of Lombroso's works may be mentioned: "L'Uomo Delinquente in Rapporto alla Antropologia, alla Giurisprudenza ed alle Discipline Carcerarie" (3 vols., 4th ed. Turin, 1889; German transl. by Fränkel, "Der Verbrecher in Anthropologischer, Aerztlicher und Juristischer Beziehung," 2 vols., Hamburg, 1887-90; Atlas, 1895); "L'Uomo di Genio" (ib. 1889; 6th ed. 1894; German transl. by Fränkel, "Der Geniale Mensch," Hamburg, 1890; translated into French, Spanish, Portuguese, Russian, etc. ); (with Guglielmo Ferrero, afterward Lombroso's son-in-law) "La Donna Delinquente" (ib. 1893; German transl. "Das Weib als Verbrecherin und Prostituirte," Hamburg, 1894); (with Laschi) "Il Delitto Politico" (2 vols., ib. 1890); "Le Crime, Causes et Remèdes"; "L'Antisemitismo e le Scienze Moderne" (ib. 1894; German ed., Leipsic, 1894); "Grafologia" (Milan, 1894); "Gli Anarchisti" (ib. 1894; German transl., Hamburg, 1895). Lombroso is associate editor of the "Archivio di Psichiatria, Antropologia Criminale e Scienze Penali." Kurella, Cesare Lombroso und die Naturgeschichte des Verbrechens, Hamburg, 1892.